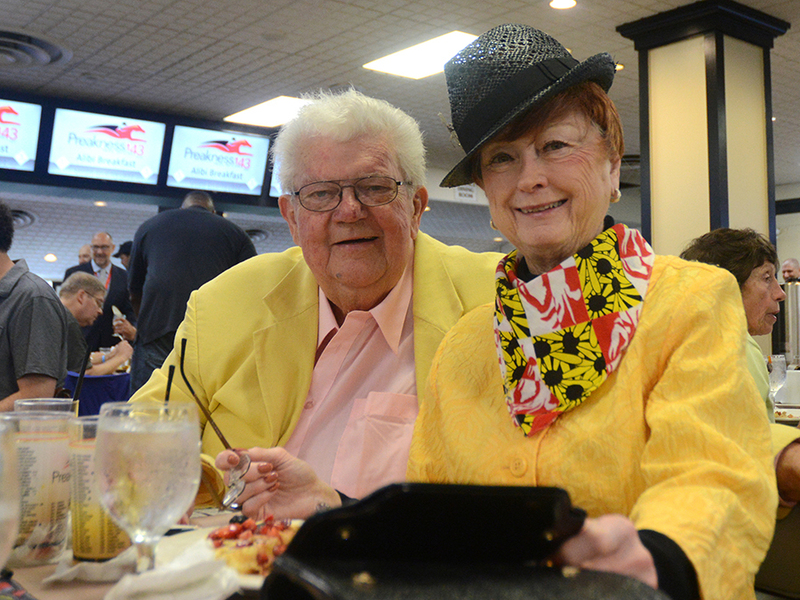 In a week full of tradition, another fan favorite took place at Pimlico Race Course as the Maryland Jockey Club hosted their annual Alibi Breakfast, held in the grand concourse Thursday morning. Started as a way for trainers, jockeys, owners, and press to exchange stories and get a sense of the field and the horses, it became a gathering where horsemen could craft their “alibis” as to why they would or wouldn’t cross the finish line first. Racing fans who attended enjoyed an indulgent spread full of breakfast staples like waffles, made to order omelets, home fries, and fruit salad, as well as special Baltimore additions like crab cakes, fried chicken, and shrimp and grits. The mood of the reception was immediately jocular and inviting, as host Scott Garceau promised Saturday’s weather would be “75 and sunny,” despite the gloomy weekend forecast. The main attraction of the morning’s breakfast, though, was the owners and trainers of the eight horses vying for the Preakness Stakes. Four horses come competing in the Kentucky Derby two weeks prior, while four new entrants joined the field. The stars of that show were trainers Bob Baffert and D. Wayne Lukas, two longtime friends and rivals who bring favored horses and impressive winning records to Pimlico. Baffert brings Kentucky Derby winner Justify, the favorite to win Saturday. Lukas has two horses running, Sporting Chance, and Good Magic, Justify’s likeliest competitor. Baffert talked of the surprising ascent of his horse, going from a possible competitor to a Derby winner in just 75 days. Lukas jokingly offered to trade his two horses, and some cash on the side, for Baffert’s frontrunner. “He’s trying to jinx me,” Baffert responded. Baffert also had plenty of warm words for Pimlico and Baltimore, calling this race his favorite of the Triple Crown, horse racing’s grand circuit that includes the Kentucky Derby, the Preakness, and the Belmont Stakes. There has been much debate in the state about the potential of the Preakness being moved from Baltimore to Laurel, Md., where the Stonach Group, the racing consortium that runs Pimlico and Laurel Race Track, has invested heavily in recent years. Part of the annual breakfast is the presentation of awards. Veteran ABC and ESPN horse racing reporter Jeannine Edwards earned the Special Award of Merit. WBAL’s Chris Dachille took home the Old Hilltop Award, adding his name to an illustrious list of media personalities. Freelance photographer Tom Law took the David F. Woods Memorial Award present by Nikon for his poignant racing shots. Each year the United States Postal Service establishes a special branch at Pimlico during Preakness week, where patrons can purchase specialty stamps and other memorabilia. Hall of Fame jockey Edgar Prado was named Honorary Postmaster of that branch, as his career of more than 7,000 wins was celebrated. He remarked on all the great people he has met in his career and all the places it afforded him to go, but he gave credit where it was most due. Friday the track plays hose to Black-eyed Susan Day, a more Maryland-centric series of stakes races. Post time for Saturday’s Preakness Stakes was announced for 6:48 p.m. EST.